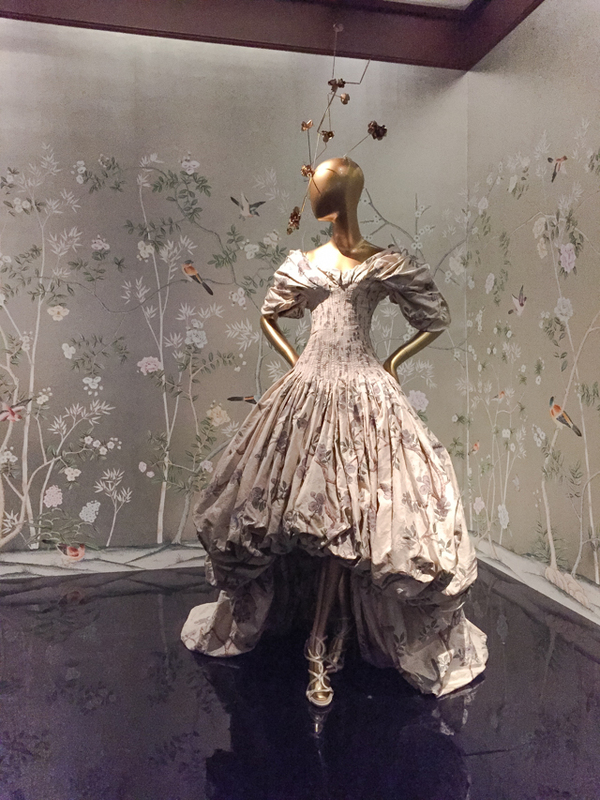 A few weeks ago my friend Elana and I had an ideal Sunday, starting with brunch at Maison Kayser and followed by a visit to the newly renovated Cooper-Hewitt museum on the Upper East Side. We had such a good time exploring! The Cooper-Hewitt is unlike any other museum that I’ve visited, and it was unique, fascinating, and beautiful on so many different levels. 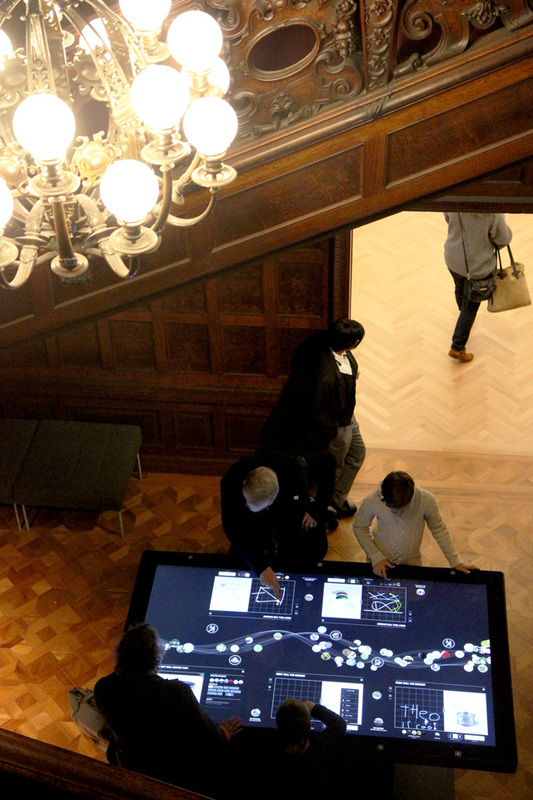 Read on to learn more about this innovative museum and see what we discovered inside. 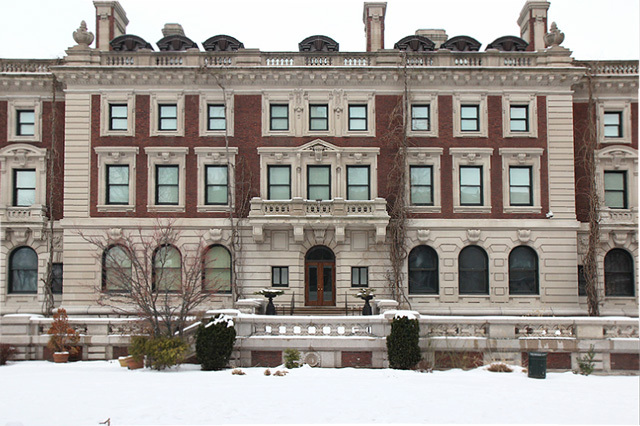 The Cooper-Hewitt is housed within the landmarked mansion of industrialist Andrew Carnegie, who, along with his wife and daughter, lived in this opulent Central Park adjacent home in the early 1900s. 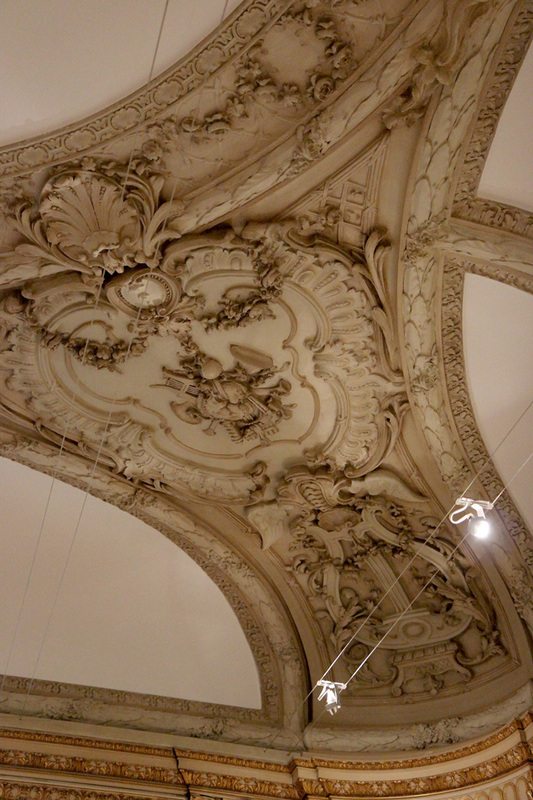 Based on looks alone, I was expecting the museum to be mainly art, like The Frick, but this is completely different. 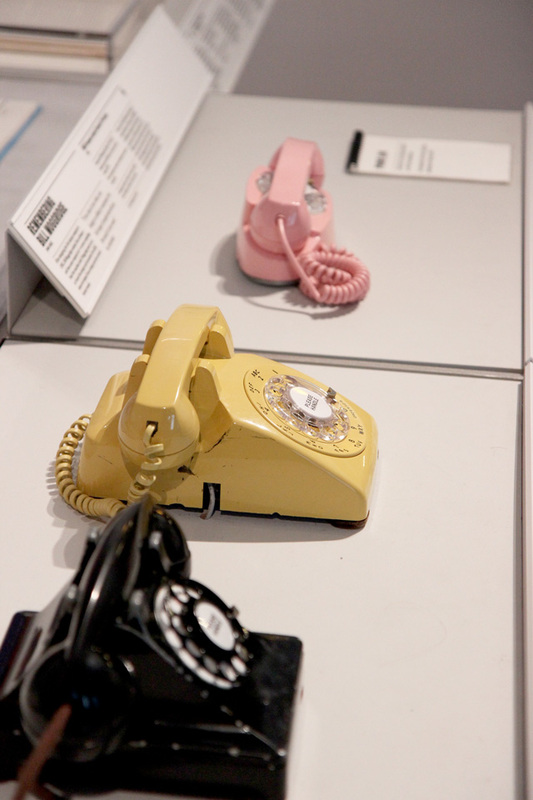 It’s the only museum in the US entirely devoted to design, from both historical periods and modern day. There were sections on textiles, product design (so interesting), prototypes, tools, and much more, alongside paintings, sculpture, antique furniture, and the like. I would almost call it a science museum as well, as there were several exhibitions focusing on innovations in science and technology as they relate to design, as well as many interactive components. 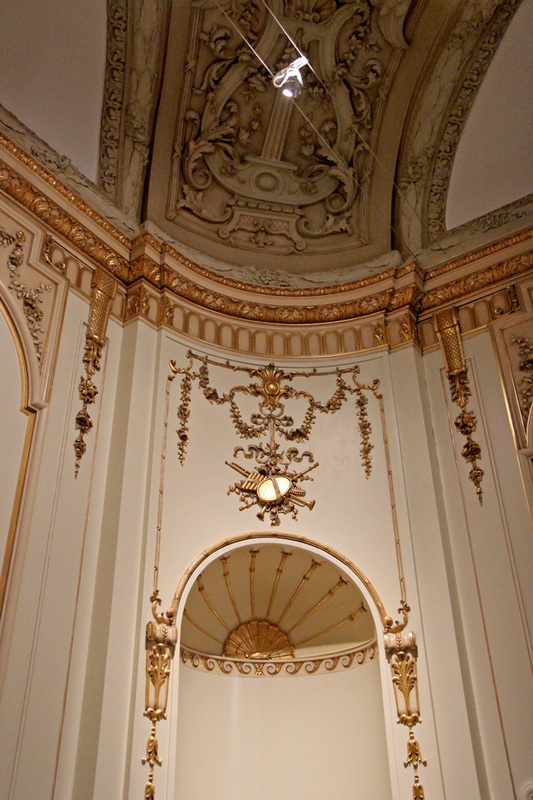 I was also under the impression that, similar to The Frick Collection (housed in Frick’s mansion and consisting of artworks he collected throughout his life) this museum would be filled with artworks collected by Carnegie, but that’s not the case. 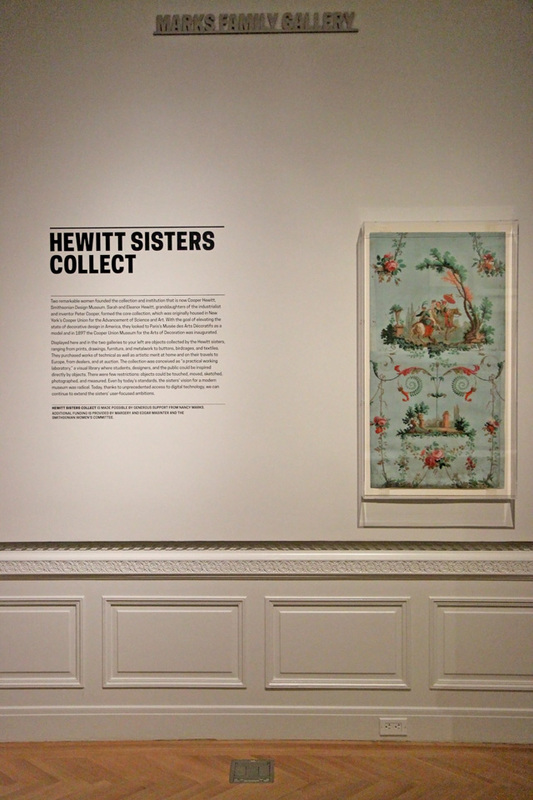 It turns out that the Cooper-Hewitt was actually founded by sisters Amy, Eleanor and Sarah Hewitt, who were the granddaughters of inventor Peter Cooper. They came up with the initial concept for a hands-on museum where visitors could participate, touch objects, and really interact with the exhibitions. The sisters contributed their own large collection of artworks amassed through their extensive travels, and they also formed an advisory committee of other influential people who contributed pieces and helped fund the museum. 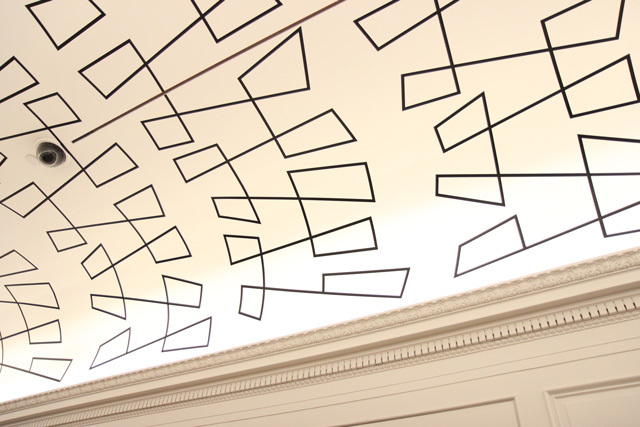 A geometric, modern ceiling effect is contrasted with gloriously ornate moldings. 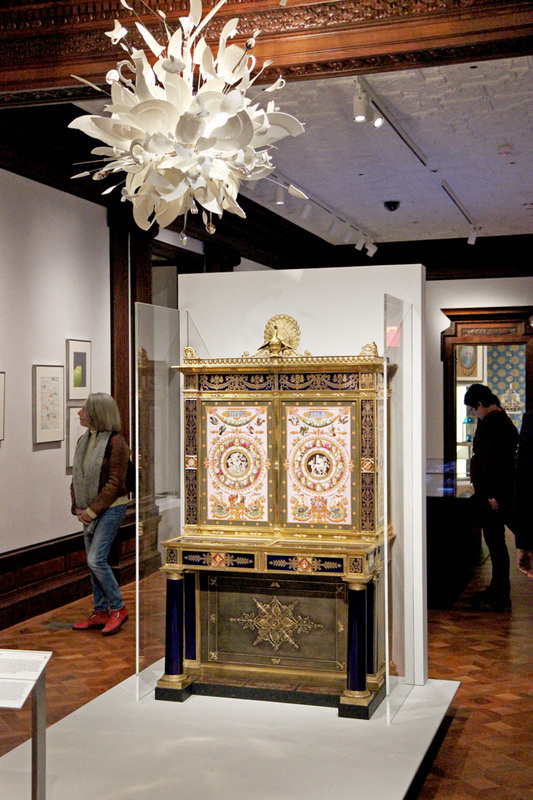 This juxtaposition between beautiful Gilded Age details and modern, forward-thinking art and design was, to me, the hallmark of this museum. 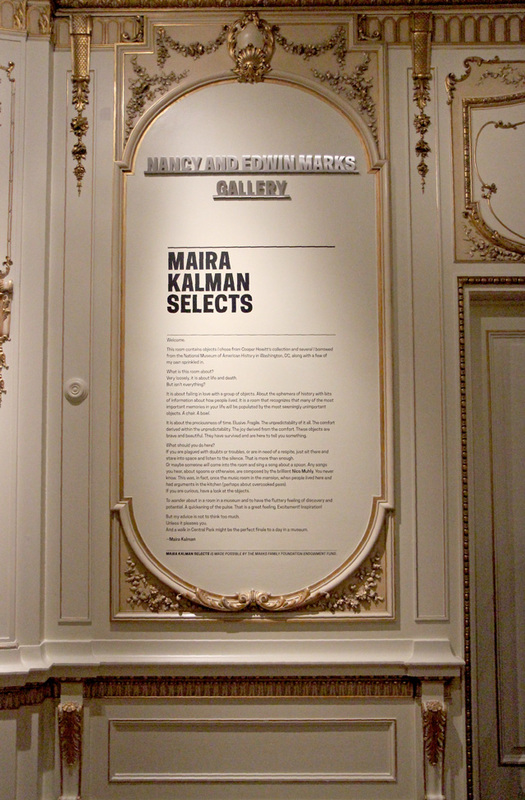 Beautiful ceilings in the Nancy and Edwin Marks Gallery, where the Maira Kalman Selects exhibition is running through June. Andrew Carnegie put a lot of his philanthropic efforts towards funding libraries across the United States. 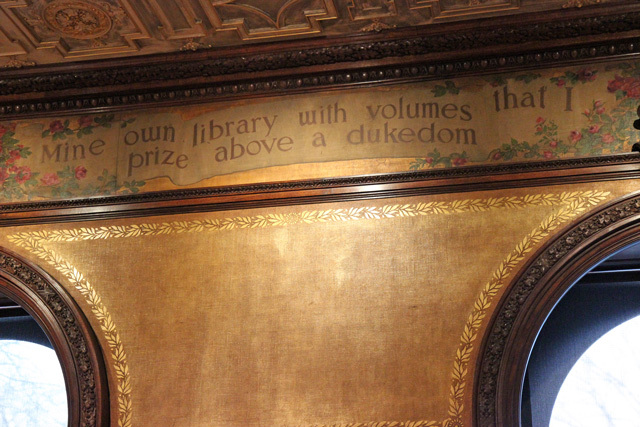 Above you can see one of the many phrases inlaid on the walls in his own library within the mansion. 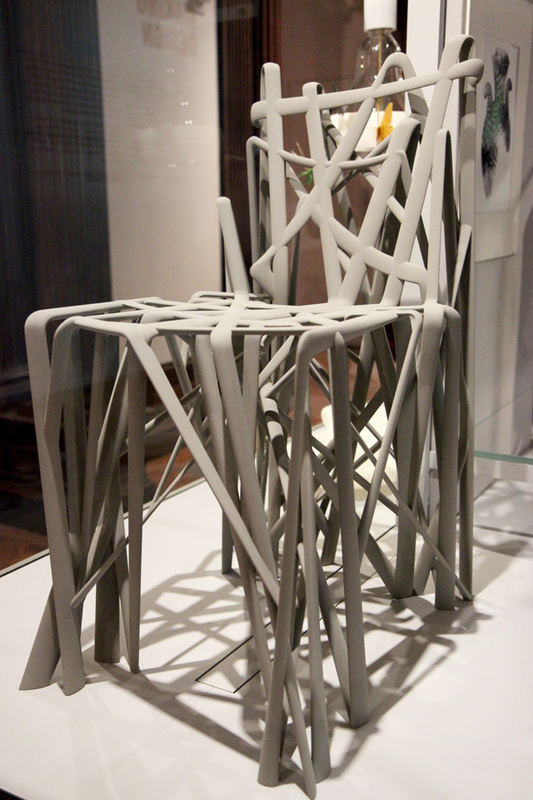 The Beautiful Users exhibition explores “user-centered” design, which is the philosophy by which designers create products with the user in mind – their comfort, the way they will utilize and interact with the object, and so on. Seems obvious, but this type of user-guided design is actually a recent phenomenon. 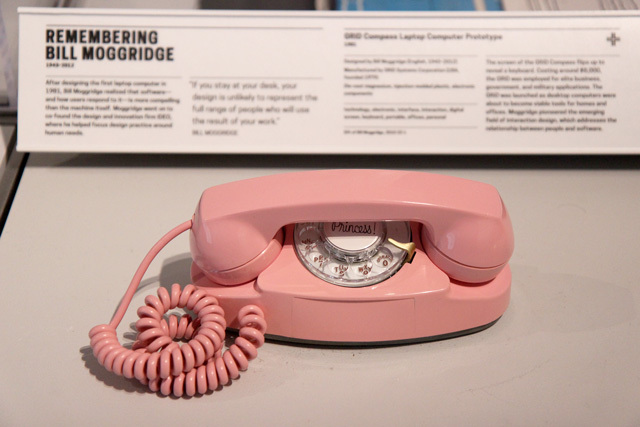 For example, the lightweight Princess telephone seen above, created in 1959, was crafted in a smaller size than its predecessors because the designers had observed that people would commonly lay down with a phone base resting on their torso while they chatted. 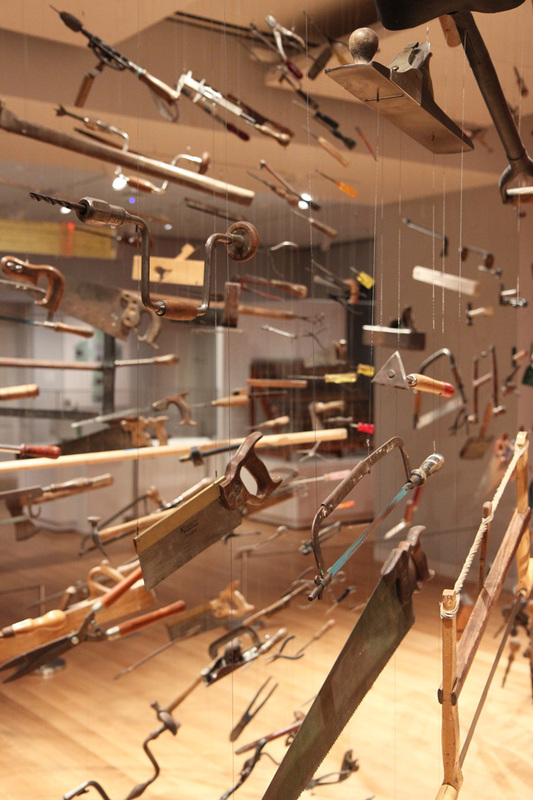 The products in the exhibition ranged from razors, to pitchers, to wheelchairs, and everything in between. The smallest products that you never think much of, like a toothbrush, or a vegetable peeler – it turns out that so much research and thought goes into designing these products to be ergonomically correct, comfortable for the user, easy to grasp, and more…just stuff that you never think about and take for granted. There was a large selection of Oxo products on view since they are a pretty big leader in this type of user-centered design. This is because Sam Farber, founder of Oxo, noticed that his wife was having trouble gripping various kitchen tools due to her arthritis. He set out to create products that could be used comfortably and easily by her, or by anyone: young, old, right-handed, left-handed, and so on. Who knew? Died for this hanging lamp designed by Ingo Maurer. 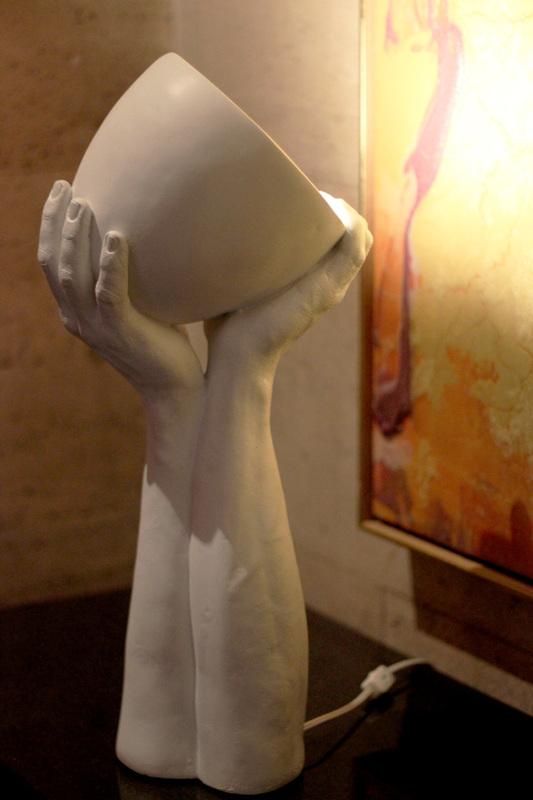 To create this incredible piece, ceramic dishes were dropped or smashed with a hammer. Some were left as they were, while others were further shaped, and then all were strung together to create this stunning piece. 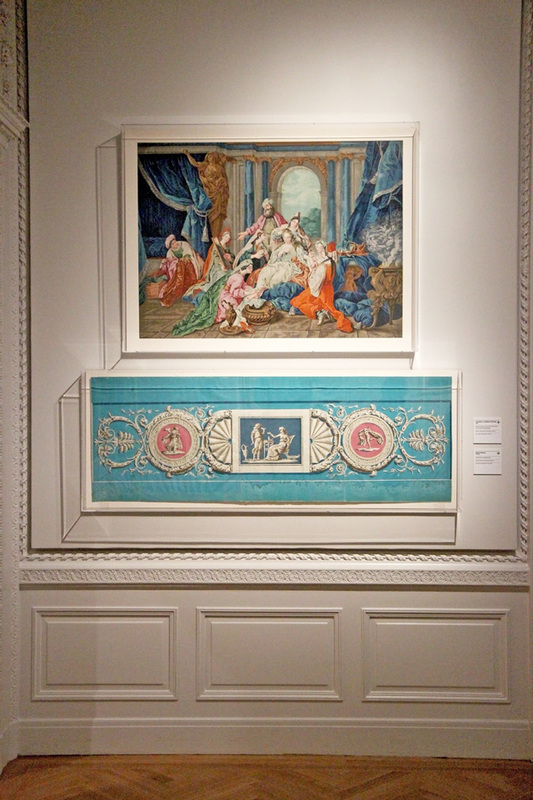 Another great example of juxtaposing super modern with antique: both of these items are crafted of porcelain, which is why they’re displayed together. All over the museum they had these huge touch screen tablets where you could do all sorts of different things, like click and learn more about the collections, or design products, or even design your own wallpaper in the Immersion Room (which could then be projected onto the wall!). 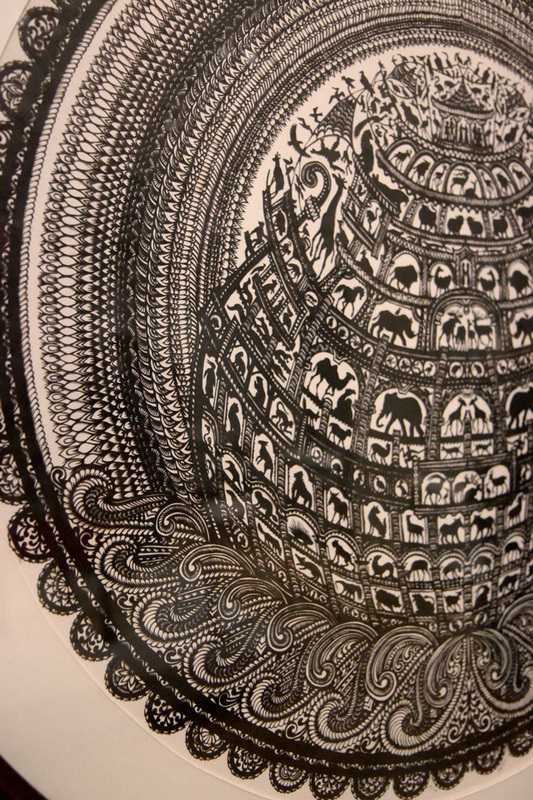 This cut paper piece is insane. It’s all one piece. ONE PIECE OF PAPER! No breaks, no nothing. I don’t understand how that’s even possible. 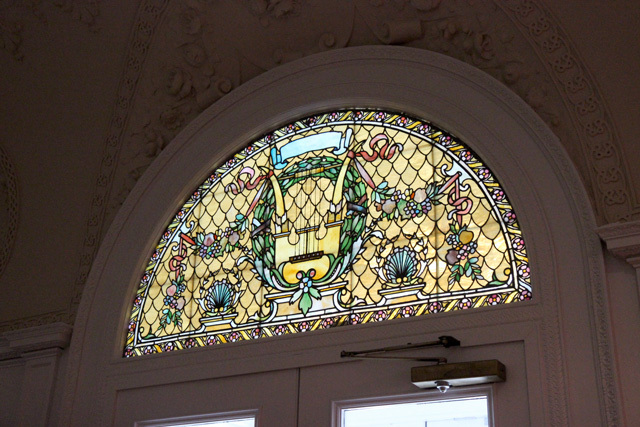 This was a touch screen computer/television type thing hanging in the hallway which showed pictures of the mansion’s rooms as they were in Carnegie’s time. 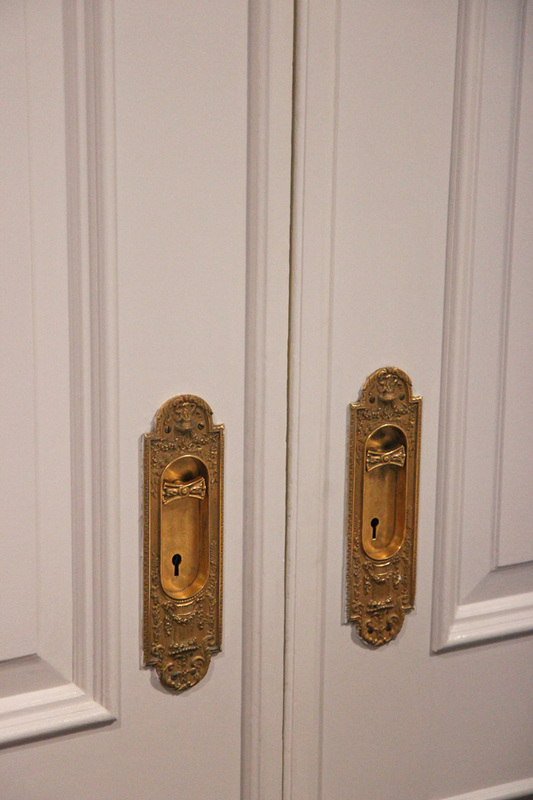 You could click from room to room and within each, click on the little boxes which would tell you about the history behind some of the furniture pieces and the house in general. Really, really fun feature. 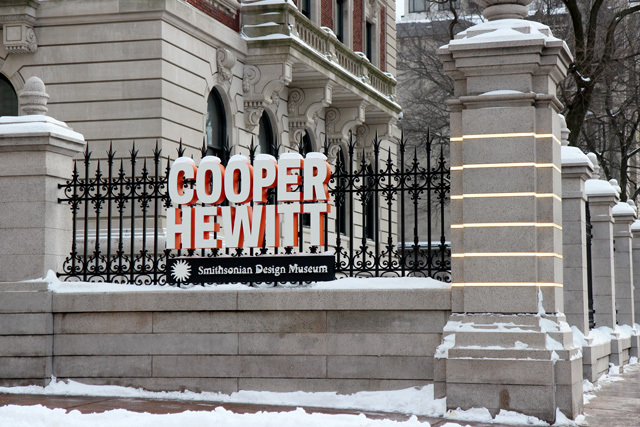 There is so, so much to see, and do, in the Cooper-Hewitt. Each exhibition and room is completely different from the last, and I think the interactive aspect makes it a great museum for kids. 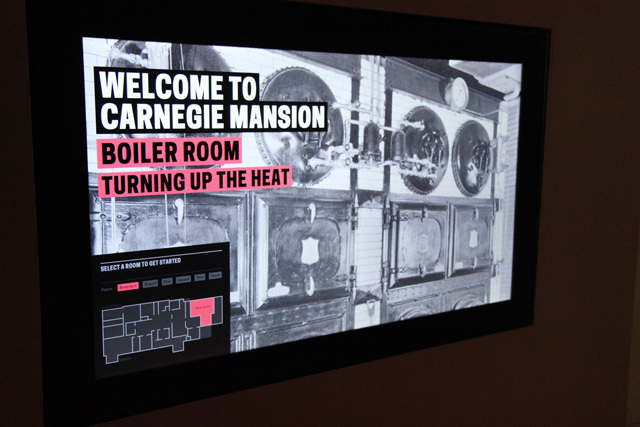 I love that as you walked through, you could learn more about the mansion and what it was like in Carnegie’s day, while also taking in the exhibitions – almost like a two-for-one. 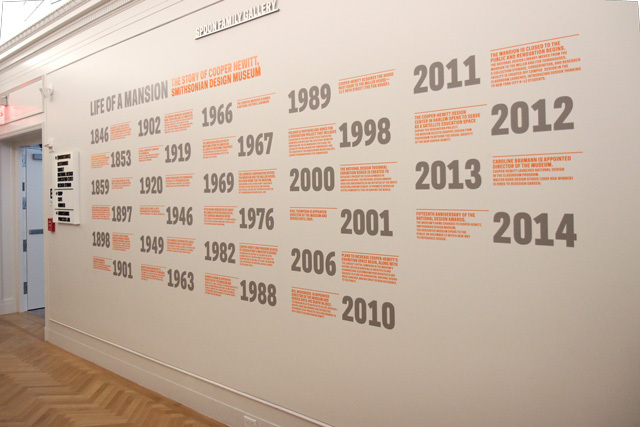 It is truly unlike any museum I’ve ever visited before, and I definitely recommend it! See more of my New York City recommendations in my NYC Guide. Hi Jackie! I have to first say your new site is just beautiful! It’s so clean and pretty – i love it and love the NYC guide. Great post on the Coopper Hewitt too! 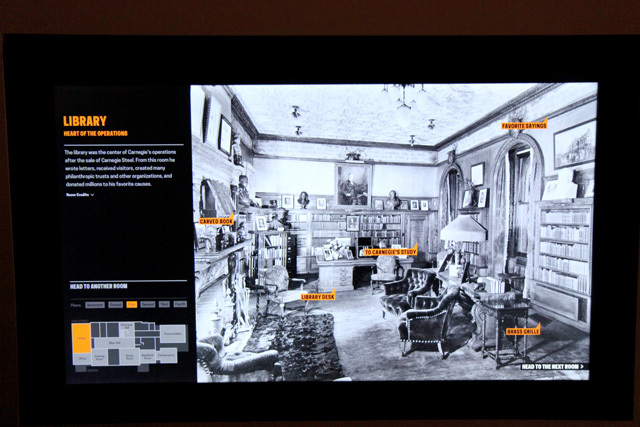 I loved your virtual tour of this quirky museum. Your blog makes me want to return to NY to see all the fascinating places you reveal that we didn’t know existed. I did wonder if you photo caption ‘weapon display’ was ironic? 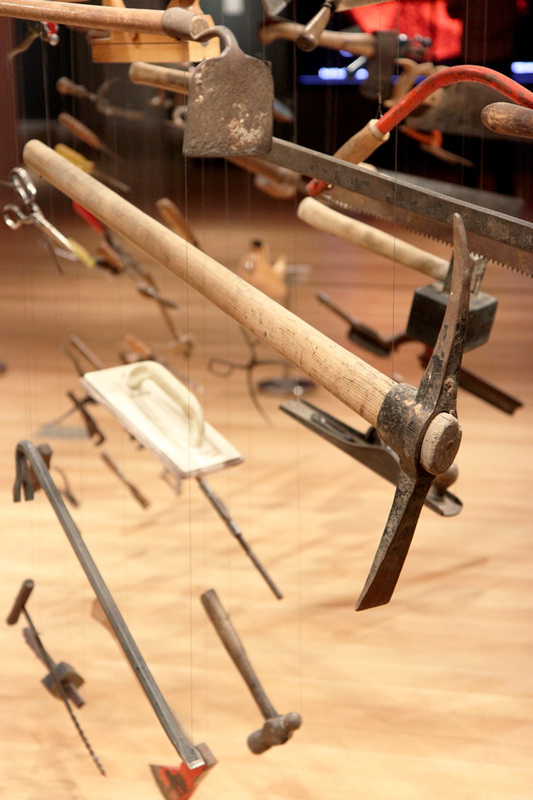 They appear to be woodworker’s hand tools. My husband and father has most of those displayed in their workshops! 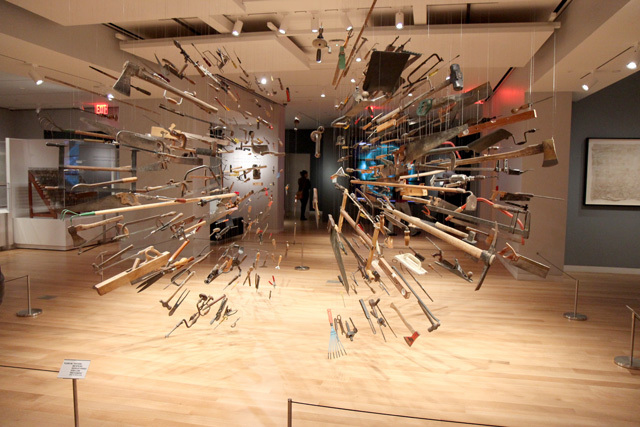 It is amazing to see such utilitarian items displayed so dramatically. Oh sheesh…Nope, not ironic, more like just ditzy! I meant to write “tools…” fixing that now, thanks! Was obviously a little overtired when I put this post together 🙂 And thank you for your sweet comment, I’m really glad you liked the post! Great post! I’ve never been to this museum but will now!! 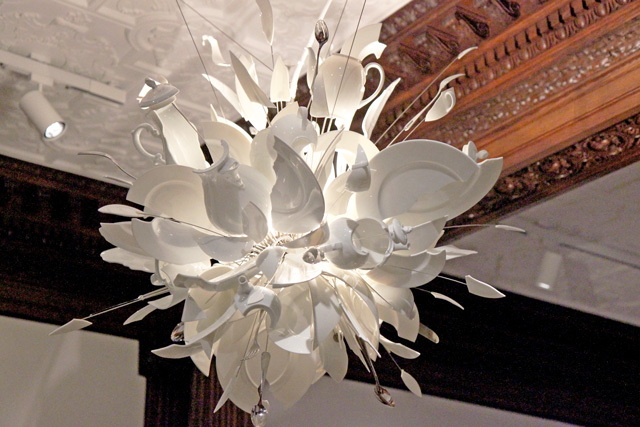 I want to say I saw that same ceramic plates chandelier at the MOMA a few years ago and fell in love with it! Time to revisit it!